Classic Remarks: Is Susan’s fate in C.S. Lewis “The Last Battle” sexist? Susan Pevensie’s fate in C.S. Lewis’ The Last Battle has been criticized for being sexist. Do you think it’s sexist or is Lewis trying to do or say something else? King Arthur lay, at Camelot upon a Christmas-tide, with many a gallant lord and lovely lady, and all the noble brotherhood of the Round Table. There they held rich revels with gay talk and jest; one while they would ride forth to joust and tourney, and again back to the court to make carols; for there was the feast holden fifteen days with all the mirth that men could devise, song and glee, glorious to hear, in the daytime, and dancing at night. Halls and chambers were crowded with noble guests, the bravest of knights and the loveliest of ladies, and Arthur himself was the comeliest king that ever held a court. For all this fair folk were in their youth, the fairest and most fortunate under heaven, and the king himself of such fame that it were hard now to name so valiant a hero. THEN stood the realm in great jeopardy long while, for every lord that was mighty of men made him strong, and many weened to have been king. Then Merlin went to the Archbishop of Canterbury, and counselled him for to send for all the lords of the realm, and all the gentlemen of arms, that they should to London come by Christmas, upon pain of cursing; and for this cause, that Jesus, that was born on that night, that he would of his great mercy show some miracle, as he was come to be king of mankind, for to show some miracle who should be rightwise king of this realm. So the Archbishop, by the advice of Merlin, sent for all the lords and gentlemen of arms that they should come by Christmas even unto London. And many of them made them clean of their life, that their prayer might be the more acceptable unto God. So in the greatest church of London, whether it were Paul’s or not the French book maketh no mention, all the estates were long or day in the church for to pray. And when matins and the first mass was done, there was seen in the churchyard, against the high altar, a great stone four square, like unto a marble stone; and in midst thereof was like an anvil of steel a foot on high, and therein stuck a fair sword naked by the point, and letters there were written in gold about the sword that said thus: — Whoso pulleth out this sword of this stone and anvil, is rightwise king born of all England. Then the people marvelled, and told it to the Archbishop. “I command,” said the Archbishop, “that ye keep you within your church and pray unto God still, that no man touch the sword till the high mass be all done.” So when all masses were done all the lords went to behold the stone and the sword. It was Christmas night and the proper things had been done. The whole village had come to dinner in hall. There had been boar’s head and venison and pork and beef and mutton and capons—but no turkey, because this bird had not yet been invented. There had been plum pudding and snap-dragon, with blue fire on the tips of one’s fingers, and as much mead as anybody could drink. Sir Ector’s health had been drunk with “Best respects, Measter,” or “Best compliments of the Season, my lords and ladies, and many of them.” There had been mummers to play an exciting dramatic presentation of a story in which St. George and a Saracen and a funny Doctor did surprising things, also carol-singers who rendered “Adeste Fideles” and “I Sing of a Maiden,” in high, clear tenor voices. After that, those children who had not been sick from their dinner played Hoodman Blind and other appropriate games, while the young men and maidens danced morris dances in the middle, the tables having been cleared away. The old folks sat round the walls holding glasses of mead in their hands and feeling thankful that they were past such capers, hoppings and skippings, while those children who had not been sick sat with them, and soon went to sleep, the small heads leaning against their shoulders. At the high table Sir Ector sat with his knightly guests, who had come for the morrow’s hunting, smiling and nodding and drinking burgundy or sherries sack or malmsey wine. ~ T.H. White, The Once and Future King, Chapter XV, 129. “What do you mean, Mr. Beaver?” panted Peter as they all scrambled up the steep bank of the valley together. It was a sledge, and it was a reindeer with bells on their harness. But they were far bigger than the Witch’s reindeer, and they were not white but brown. And on the sledge sat a person whom everyone knew the moment they set eyes on him. He was a huge man in a bright red robe (bright as hollyberries) with a hood that had fur inside it and a great white beard that fell like a foamy waterfall over his chest. Everyone knew him because, though you se people of his sort only in Narnia, you see pictures of them and hear them talked about even in our world—the world on this side of the wardrobe door. But when you really see them in Narnia it is rather different. Some of the pictures of Father Christmas in our world make him look only funny and jolly. But now that the children actually stood looking at him they didn’t find it quite like that. He was so big, and so glad, and so real, that they all became quite still. They felt very glad, but also solemn. ~ C.S. Lewis, The Lion, the Witch, and the Wardrobe, 106-107. Now in those days a decree went out from Caesar Augustus, that a census be taken of all the inhabited earth. This was the first census taken while Quirinius was governor of Syria. And everyone was on his way to register for the census, each to his own city. Joseph also went up from Galilee, from the city of Nazareth, to Judea, to the city of David which is called Bethlehem, because he was of the house and family of David, in order to register along with Mary, who was engaged to him, and was with child. While they were there, the days were completed for her to give birth. And she gave birth to her firstborn son; and she wrapped Him in cloths, and laid Him in a manger, because there was no room for them in the inn. When the angels had gone away from them into heaven, the shepherds began saying to one another, “Let us go straight to Bethlehem then, and see this thing that has happened which the Lord has made known to us.” So they came in a hurry and found their way to Mary and Joseph, and the baby as He lay in the manger. When they had seen this, they made known the statement which had been told them about this Child. And all who heard it wondered at the things which were told them by the shepherds. But Mary treasured all these things, pondering them in her heart. The shepherds went back, glorifying and praising God for all that they had heard and seen, just as had been told them. ~ Luke 2: 1-20, NASB. A most glorious and Merry Christmas to you all! What a fantastic episode of Doctor Who this would make! Topic: Which literary villain is the best? Even acknowledging the great diversity of ways a villain can be a good character, and the difficulty of finding a paragon of one such Way that can be judged higher than those of other Ways, the shortlist for this topic was easy to compile. The reason is simple: the best villains embody something that we instinctively realize as something we are Against, and thus the most powerfully-written or conceptualized baddies will become reference points for other evils we encounter, both in literature and real life. They are Memorable. But different kinds of villain are Memorable for different reasons. The Golden Bookwyrm lays out three main criteria: slimeballness, cunning, and malicious intent. For Jubilare and Terpsichore, the best villains are the ones that are preeminently effective; perhaps so much that even after their defeat they retain a nightmarish power to influence people and invade a readers’ dreams. For Thalia and EmilyKazakh, the villain may not even think of himself or herself as evil, and may even masquerade as a member of the “good guy” team. For Urania, the best villain must be uniquely integral to the story’s plot and atmosphere; if you replaced him with another personality, the story would be fundamentally altered. All these are common and excellent factors for making a villain great, but I think the most important is the one Urania mentioned – it must be impossible to imagine the story without them! That doesn’t narrow my shortlist at all, though. I initially thought of Emperor Brandin, from Guy Gavriel Kay’s Tigana, who is magnificently complex and terrifying, precisely because his evil does not prevent him from being wise and genuinely caring for his people. One of the scariest parts of the story is when our heroes realize that the conquered citizenry are beginning to love the brutal tyrant, and may not support a heroic rebellion, instead letting Brandin get away with a grievous psychological war crime. His charisma, both in the book and as it extends to the reader, is considerable. But he is not quite archetypal enough for this post. Then I thought of Long John Silver from Robert Louis Stevenson’s Treasure Island (a review of which has been in the works for a few months now…*guilty cough*), whose literary greatness is proven by his continued popularity, but whose main weakness in this category is that he ends the story rather humiliated and ineffective, and wouldn’t stand much of a chance against any of the other villainous candidates. Not enough to stop him from being near the top of my list, but enough to give me an excuse for passing him over just now. In fact, I nearly had to just copy Urania’s post, for when she chose Captain Hook, it seemed so blindingly obvious that for awhile I could contemplate no other choice. Dastardly villainous and always entertaining, Hook truly is an archetypal figure from children’s nightmares, who is perfectly suited to his story. After all, what would the world be like without Captain Hook? Indeed, my final choice is one I consider to be Captain Hook’s equal in Magnificent Villainy. She haunts you and the protagonists long after her initial defeat, she can use subtle manipulation and brute force equally well, and she nearly wins by charisma alone. Yet what wins her this topic for me is how well she represents the nature and end of Sin. She’s the White Witch from Lewis’ Chronicles of Narnia. What else can I say about the White Witch, the self-proclaimed Queen of Narnia? She’ll wrap you in furs, serve you hot chocolate, and persuade you to betray your family to their deaths. She’ll nearly turn you to stone if you forget to call her “Your Majesty,” unless you have something she wants and don’t yet suspect her, whence she will abruptly act in a convincing manner both motherly and seductive – a disturbing combination when you realize it, but the danger is that many, like poor Edmund, don’t realize it until it’s too late. She even drove Father Christmas out of the world! Now that’s evil for you, folks. Oh, and she also destroyed her entire homeworld by the uttering of a Deplorable Word, out of mere hatred for her sister. She would rather be queen of a murdered planet than live without power over others. Her archetypal power comes from how well she embodies the nature of sin. Not only is it corrosive, hateful, and greedy, but it’s lonely, conniving, and desirous of appearing good. The White Witch looks attractive: her face is beautiful, her clothes stylish, her manner sometimes quite flattering and understanding. Her determination and strong charisma can be deceptively appealing even while you’re aware that she’s cold and cruel to her core. Yet one would be a fool to take her at her word, or to let themselves near her at all. She loves nothing, not even herself. She tries to salve her hatred with rebellion against everything good, against everything Aslan created. She wants to possess what she herself could not create. Yet for all her rebellion and power, she is still bound by heavenly laws. She takes Aslan’s life in exchange for Edmund’s, but cannot prevent this from leading to Edmund’s salvation and Aslan’s resurrection. For all evil is but a cringing, pathetic thing in the light of the holy God. The White Witch, for however “cool” she seems when we read the books or watch the exciting movie adaptations, is really a desperate, dying, disgusting creature, incapable of anything good. She has lost from the beginning. It was written in the Deeper Magic by Emperor-Over-the-Sea Himself. Unfortunately, this will be my last post in Lewis’ book, at least for the time being. Why? The book is due back to the library tomorrow and I’ve already renewed it twice. But weep not, my friends! For this is one of the more important chapters for understanding what people like Lewis, Tolkien, and MacDonald (hereafter grouped together as the Great Trio) meant when they spoke of myths and fairy stories. You see, it’s so dreadfully hard to define the word myth, in its deepest sense. Obviously we are not using the word to mean merely “an untrue story,” as you hear the Mythbusters use it. We are using it closer to the cultural sense: the Greek myths, the Egyptian myths, the Scandinavian myths, the Chinese myths, and etcetera. And yet, not completely in this sense. The Great Trio tend to accord the kind of story called myth a reverence and awe which I do not see in many of the stories I read in my classics and ancient history courses. The story of Ares and Aphrodite getting caught, mid-coitus, in Hephaestus’ net and exposed to all the deities of Olympus seems more akin to a medieval fabliau than Eros’ wooing of Psyche. If we go steadily through all the myths of any people we shall be appalled by much of what we read. Most of them…are to us meaningless and shocking; shocking not only by their cruelty and obscenity but by their apparent silliness—almost what seems insanity. Out of this rank of squalid undergrowth the great myths—Orpheus, Demeter and Persephone, the Hesperides, Balder, Ragnarok, or Ilmarinen’s forging of the Sampo—rise like elms. Those great myths—the ones we remember most strongly and poignantly—clearly have a different nature than their lesser cousins. They are retold in endless variations, they are alluded to in poetry and literature, they become reference points even in everyday speech, and they provide subjects for art all through the ages. The thing is, we can find similar kinds of stories that have been written even in recent times, by specific authors rather than anonymous cultural entities. Dr. Jekyll and Mr. Hyde, for one, and A Christmas Carol for another. We might call these stories “mythic,” because they share a certain nature with the great myths. They are “extra-literary.” Meaning, their power lies in the plot or the central idea, and not in the particular words used to tell the story. Those who encounter the myth of Eros and Psyche separately from Apuleius, Robert Graves, Thomas Bulfinch, and C.S. Lewis will nonetheless have a shared mythical experience; the power the story works on them will be much the same from these various sources, so long as the plot is preserved. But those who encounter the same story through Shakespeare’s Romeo and Juliet and 1996’s Romeo + Juliet encounter only the same plot, not the same power, because the words of Shakespeare and the style of Baz Luhrman dominate the plot. Myth always has a supernatural or magical element. The mythic experience is always grave and serious in some way. It may be joyful or sorrowful, warm or cold, but it is never comic. And not only grave, but numinous. It is awe-inspiring and awful in the original sense. It feels weighty and important, both in general and to us personally, and no allegorical explanation of it will fully satisfy us (or should not). A true myth reminds us of the spiritual realm, which is larger than us. Looking at this list, Lewis and I both notice the same thread running through it: he is describing myth based on its effect on us. The application of the label myth to any particular story must then have some element of subjectivity to it. Imagine the tip of an iceberg. We know there is a great something floating beneath the arctic waves, and but we are not concerned with it. We are concerned with the tip itself as an object worthy of contemplation. Likewise there is much that can be said about the psychology behind mythical stories, why they affect us and how they have developed, and those studies are fine. But they are irrelevant here. We are concerned with how people read, and specifically with how they experience stories. And a lover of a myth loves the myth no matter how he receives it, even if it is through a bad storyteller. …[the lover of myth] will then delight in that literary work for its own sake. But this literary delight will be distinct from his appreciation of the myth; just as our pictorial enjoyment of Botticelli’s Birth of Venus is distinct from our reactions, whatever they may be, to the myth it celebrates. We must never assume that we know exactly what is happening when anyone else reads a book. Some books are more likely to produce excellent experiences than others, but two people may read the same book, and one enjoy it only as entertainment, while the other walks away deeply moved and forever changed. Each art is itself and not some other art. Words mean things in a way that musical notes do not. So while the best appreciation of a symphony may be to attend to the intricacy of the notes themselves, even apart from the subjective meanings they suggest to the listeners, we cannot say the same of a book. We cannot just pass our eyes over the shapes of ink on a page and call that reading; we must attend to the meanings and connotations—both objective and subjective—of the words. The first note of a symphony demands attention to nothing but itself. The first word of the Iliad directs our minds to anger; something we are acquainted with outside the poem and outside literature altogether. Next, Lewis notes five primary characteristics he has observed in unliterary readers; that is, those who use books instead of receiving them. They have no literary ear. They are deaf to both the beauties and “cacophonies” of certain phrasings. This is especially horrible with academics, who are very well-read. “They will write of the relation between mechanisation and nationalisation’ without turning a hair” (29). More generally, “they are either quite unconscious of style, or even prefer books which we should think badly written” (29). The really good, unqiue writing demands too much of them. They prefer Flash Gordon to H.G. Wells. Or in modern terms, Twilight to Bram Stoker’s Dracula, and Eragon to The Lord of the Rings. They dislike much dialogue, preferring more pictures and action. Now, I think Lewis is too generalized with this point. It seems these days that the unliterary often prefer lots of dialogue—so long as it is bad, clichéd, and accompanied by wild action or slapstick comedy. Many good and great books favor prose over dialogue, just as many great films are also light on dialogue (and I’m not just thinking of silent films, though those are included). But his point still stands. The unliterary prefers not to think about what he is reading, and wants only to absorb and vegetate. Intelligent dialogue and prose make a claim on his energies that he is unwilling to grant. “They demand swift-moving narrative” (30). Common condemnations of other works include “it’s too slow” or “it’s too complicated.” And I admit fully that I share Lewis’ disdain for such people. Their complaint is different from a considered critique that a book is too slowly paced or too boring in that it is an excuse to not really consider the book at all. They will resist enjoying a book solely because it doesn’t work hard enough (by their standards) to grip their wilted attention spans. Point 3, about style, interests Lewis the most. It’s not that the unliterary reader enjoys bad writing because it is bad. He hardly even notices it. To be conscious of style means to take the words themselves seriously, but the unliterary reader cares only for the Event. Writing that really tries to describe specific things, people, and ideas demand more of his attention than he wants to give, but clichés absolve him of this obligation. He wants everything to be instantly and shallowly recognizable: “My blood ran cold” is the descriptor he prefers to fear over, say, a more complex observation by Dostoevsky, or even another metaphor that is still concise but so specific as to make the reader remember his own fears. Unless we are fully attending both to sound and sense, unless we hold ourselves obediently ready to conceive, imagine, and feel as the words invite us, we shall not have these experiences. Unless you are really trying to look through the lens you cannot discover whether it is good or bad. We can never know that a piece of writing is bad unless we have begun by trying to read it as if it was very good and ended by discovering that we were paying the author an undeserved compliment. See, good writing knows when to use many words and when to use few words, but an unliterary reader cannot tell this difference. So he may read a detailed landscape by D. H. Lawrence or John Steinbeck and find them too much to handle, but then think that Thomas Malory was being stingy with words when he wrote: “he arrived afore a castle which was rich and fair and there was a postern opened towards the sea, and was open without any keeping, save two lions kept the entry, and the moon shone clear.” The unliterary reader wants a degree of sensationalism so he can pretend he is imagining without doing the actual mental work. They would rather be told that the castle was ‘bathed in a flood of silver moonlight’. This is partly because their attention to the words they read is so insufficient. Everything has to be stressed, or ‘written up’, or it will barely be noticed. But still more, they want the hieroglyph—something that will release their stereotyped reactions to moonlight (moonlight, of course, as something in books, songs, and films; I believe that memories of the real world are very feebly operative while they read). As a writer, I can say this is a particularly important, but difficult, point that Lewis is making. The temptation is so strong to write stereotyped descriptions and characters: the hills always verdant and rolling, the clouds fluffy and white, the mountains jagged and majestic. These adjective are true, but they are generic, and do not describe the uniqueness of a this hill, these clouds, or that mountain. But to achieve the better writing means to imagine better. To understand just what is important about the thing I am describing; why is it here, why am I putting it in this place of the story, how does it affect the other things in the story, and what memories and emotions are attached to it? The first demand any work of any art makes upon us is surrender. By way of expanding the uses of his theory, and of providing more varied examples, Lewis begins noting how the “many” tend to approach visual arts and music in a way that prevents them from being really experienced. His observation on art boils down to this: that most people like pictures and paintings primarily for the subject or scene rather than for the artistic expression. If the painting is of something they like – a pastoral scene, an energetic battle, an alluringly unclad woman, etc. – then they will like it better than a superior painting that is of a scene that does not inherently interest them – say, a still life, or a portrait like the Mona Lisa. So it is that Lewis himself, as a child, loved all the illustrations of Beatrix Potter because he loved anthropomorphised animals, but made no distinction between her good illustrations and her hasty, ill-drawn ones. Used this way, art is reduced to the value of a toy or a religious icon. While you retain this attitude you treat the picture—or rather a hasty and unconscious selection of elements in the picture—as a self-starter for certain imaginative and emotional activities of your own. In other words, you ‘do things with it’. You don’t lay yourself open to what it, by being in its totality precisely the thing it is, can do to you. His observation on music is similar: the many invariably go to music which either provokes a social response (dancing, humming, clapping) by an infectious rhythm or melody, or which incites strong emotional responses and daydreams. Or all of these, of course. Lewis believes that nearly all of us start in the many with regards to music, and only begin to appreciate it with time and some musical education. We listen to most music just for the tune or rhythm, usually failing to notice and appreciate all the wonderful choices in arrangement and performance. And the more we focus on the images and emotions that a song conjures up for us, the less we notice the actual music itself. As regards one instrument (the bagpipes) I am still in this condition. I can’t tell one piece from another, nor a good piper from a bad. It is all just ‘pipes’, all equally intoxicating, heartrending, orgiastic. Now, as Lewis has warned before, these popular uses of pictures and music are not inherently bad or wrong. Keats looked at the black figures on a piece of ancient pottery and was inspired to write “Ode on a Grecian Urn,” and that was very good. “But admirable in its own way; not admirable as an appreciation of ceramic art” (18), if that was his only reaction to it. And to deny the “organic,” emotional responses to music would be not just foolish, but utterly insane! I interject quickly to say that I don’t think Lewis is denying that musical people will ever hum and whistle a tune while listening to the song, but rather that they are always sure to take time to listen to songs with their full attention, in order to pick out all its notes and unique details. Their enjoyment becomes “impregnated with intelligence.” We could even say that it is informed enjoyment, and “far more sensuous than the popular use; more tied to the ear” (24). With art and music, as with books, we should open ourselves fully to what the artist is doing with his particular art. We must try to rid ourselves of preconceptions and prejudices—not of all thought or opinions, certainly, but of our own demands for what we want the piece of art to be. I studied classics at university, and I can tell you that I really don't like Mars or Venus, or their Greek counterparts Ares and Aphrodite. But this painting is beautiful. But the good spectator–like the good reader–is not passive. He receives a work of art for what it is, in order to learn what its own terms are, so that he may see more accurately what it is. Once these terms are understood, he may decide that they are not worth his full employment. So we draw a distinction between good and bad approaches to art. Good art can possibly be used for unworthy purposes, but it encourages a good, intelligent approach. On the other hand, “a bad picture cannot be enjoyed with that full and disciplined ‘reception’ which the few give to a good one.” Try gazing for a long period at a painting by da Vinci or Jacques Louis David; you will be drawn into it, marveling over little details, a line here, the colors there, the shape and composition of the whole. But try the same experiment with a poor painting or drawing, and you will find there is no real substance to concentrate on. You will likely even find that the more concentration you give it, the worse the picture appears, as all its artistic faults become apparent! That is the heart of Lewis’ argument, and one of the most important passages in the book. Another easy example for us to consider is film. Most people go to the movies just so they can turn their brains off and have various emotions pricked and tickled while they watch attractive people doing things they find attractive. They actively resist movies that try to demand more of them as viewers, or that have elements that don’t conform to what they know they like. But if I had never sat down to watch Citizen Kane to humor my dad’s interest, I never would have discovered what a fantastically entertaining movie that is, in addition to it being a fantastically intelligent and insightful one. Had I never agreed, however reluctantly, as a kid, to watch a boring-sounding movie about a girl and some geese, I never would have experienced the beauty of Fly Away Home. But back to books. I admit that I very rarely read a book that is not fantasy or history-related. Other books simply interest me less. I know my comfort zone (and pretend it’s some kind of expertise), “what I like.” And, ultimately, this is detrimental. Now, because I have known of this danger for years, I do try to mitigate its effects. Every so often I step aside to read a nonfiction book, maybe even one that has nothing to do with writing or history. And while I think all my literature classes from fifth grade through university could have used more great fantasy literature, I am also grateful that they forced me to read novels I never otherwise would have considered: To Kill a Mockingbird, Crime & Punishment, even The Scarlet Letter. Even the books I disliked gave me experiences I could not have had otherwise, and thus played some role in enriching me. I leave you now with a good piece of music to Listen to and consider in enjoyment. Can you think of a painting or piece of music which, by paying long and considerable attention to it purely for its own sake, you were able to enjoy it more fully? Having used the terms “the many” and “the few” to refer to the two broad groups of readers – those who use books for some purpose and those who receive each book for what it is – Lewis immediately points out the many false connotations the terms may have. We must not think of “the many” as the uneducated common man, the “rabble” whose perceived illiteracy some critics think “must make them clumsy and insensitive in all the relations of life and render them a permanent danger to civilization” (5). Rather, these people may have in other aspects of their life – moral, psychological, or pertaining to knowledge, adaptability, great skill, or wisdom – an excellence and care that they simply do not extend to literature. And the literary (Lewis begins to use the term again), “include no small percentage of the ignorant, the caddish, the stunted, the warped, and the truculent” (6). To assume that any person who does not read a book in the best way is somehow inferior in other areas of their life is wholly wrong, and Lewis is right to condemn this prejudice. In fact, many of the people we most expect to be authorities on literature may not be true bibliophiles – that is, lovers of books. Lewis expresses sympathy for professors who, to keep their jobs, must continually publish articles “which must say, or seem to say, something new about some literary work; or of overworked reviewers, getting through novel after novel as quickly as they can, like a schoolboy doing his ‘prep’. For such people reading often becomes mere work” (7). He tells an anecdote about a fellow colleague, a professor of literature, who, just after having given a tiring exam to his students, was annoyed that Lewis wanted to discuss one of the great poets who was a subject of the exam. I must pause here to reflect on myself. Many of my classmates would be so sick of a certain book or author whom we’d had to study that they expressed shock or annoyance if I wanted to keep talking about it. It’s completely understandable, because literature courses tend to make reading books a chore and an obligation rather than a joy. And to Lewis’ point about reviewers I can most certainly relate! It was amusing to read his remark, as I have had to take certain steps to guard myself against falling into this trap; that is, the trap of reading books primarily because I feel an obligation to review them for my blog. My goal with this blog is not to review every fantasy or sci-fi book I read or movie I watch. Sometimes I purposely don’t review a story, and for a variety of reasons: maybe I can’t think of anything worthwhile to say about it, maybe it’s too exhausting to think about, or, often, I’m happier just absorbing the experience of it without having to analyze it. About a week ago I watched (again) one of my favorite movies, The Secret of Roan Inish (1994). Each viewing is as wonderful as the last, excepting the peculiar magic that first viewings and first readings have. Yet I chose to savor the experience, let it work its own way with me, rather than immediately set down to dissect it. I love it so much that I’m sure I will review it eventually, but out of an overwhelming desire to share it, not out of obligation. Lewis notes other reasons people read a lot yet are not literary in his sense of the word. There are, as above, those who are professional readers. Reading and analyzing books is their job, and they are in danger of viewing books merely as fodder for their essays and theories than as worthy objects in their own right. There are status seekers, who read only what is fashionable with a certain group in order to be accepted by them. There are the devotees of culture, who read in order to improve themselves. This is an interesting group, because such a person is, in a sense, trying to discover what treasures the books hold. However, he is still using the books for a purpose other than themselves. He is likely to stick only to the authors that he has been told are great, and “makes few experiments and has few favorites” (8). This man is not a fool, and he can get much good from reading the right books. But Lewis likens him to a man who plays sports only for the health benefits and not for any joy inherent in the act of playing. There is nothing wrong with discussing books for one’s job, or with reading a book that is popular, or with seeking out books you think will do you good. Many of us do the latter all the time, and that can be fine and good. But if these are your main reasons for reading, if when you read a book you will only see these things you look for and nothing else, then you are missing something. In all these examples the reader is focused on himself rather than on the book. One sad result of making English Literature a ‘subject’ at schools and universities is that the reading of great authors is, from early years, stamped upon the minds of conscientious and submissive young people as something meritorious. For these reasons Lewis does not use the word serious to describe literary people. 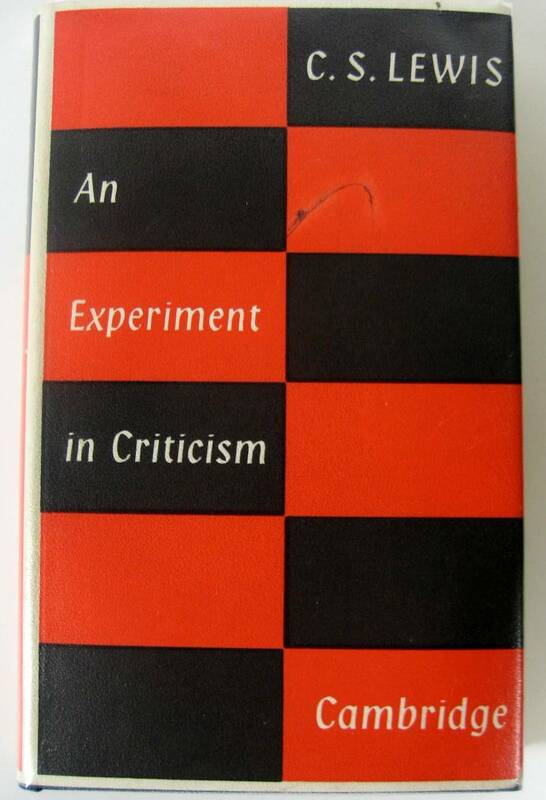 I’ve been tempted to use the word myself when describing An Experiment in Criticism to other people, but stopped myself for the same reasons Lewis has: the word has two meanings, and the one most commonly assumed is the last one we want. It may mean, on the one hand, something like ‘grave’ or ‘solemn’; on the other, something more like ‘thoroughgoing, whole-hearted, energetic’…The serious man, far from being a serious student, may be a dabbler and a dilettante. The serious student may be as playful as Mercutio. A thing may be done seriously in the one sense and yet not in the other (11). When I write my reviews, I do not ignore the themes and literary devices of the stories. But my goal is primarily to find out what the writer is saying, and to receive that as best I can. Some stories offer up their key themes as a gift to the reader and viewer. Other stories don’t, and for those I try not to force upon them themes that are not there. I’m grateful for Lewis’ book. Though I have thought many of the same things many times before, it is helpful to have him clarify, offer examples, and occasionally challenge me. I fear that many of my past readings were unfair to the books, especially to those I read for school. How many authors have been wronged by my unreadiness to hear what they had to say? This is not to imply that every book I have disliked in the past was worthy of my attention. But, looking back, I think there were many that had much good that I did not see, because I was too wrapped up in my own preferences to listen to another mind, another heart, expressing itself. So, in a series of posts, I will be presenting to you the essential ideas Lewis discusses, along with my own thoughts and commentaries. Lewis’ experiment is essentially this: to examine different types of reading, and to see what this tells us about types of readers and types of books. Let us try to discover how far it might be plausible to define a good book as a book which is read in one way, and a bad book as a book which is read in another. He immediately begins using “the majority” and “the few” to distinguish between the two primary groups of readers. Later on he becomes more specific and begins to define his terms, an exercise very important if he is to avoid over-generalization and snobbery. But for the beginning, the broadness of these terms will suffice. “The majority” are the mass of people who use books primarily or solely for some other ultimate goal: entertainment, distraction, knowledge, social acceptance, etcetera. “The few” are those for whom the act of reading books is more than just these goals, and is a passionate, vital activity on its own merits. Such is my paraphrasing. To quickly sketch the two groups for us, Lewis notes four broad differences between them. …the majority never read anything twice. The sure mark of an unliterary man is that he considers ‘I’ve read it already’ to be a conclusive argument against reading a work…Those who read great works, on the other hand, will read the same work ten, twenty or thirty times during the course of their life. I think it is fair to acknowledge that many book-lovers greatly desire to reread good books, but, due to the circumstances of their lives, have not the time. Still, a “true reader” will have this desire, and, have they the ability, will reread the books that mean something good to them. Now, at this time, Lewis is not defining what a great book is or what a bad book is, objectively. He is concerned with how readers value books. I, for example, am most certainly a rereader. Sometimes I will reread an older book instead of starting one I have just bought. I get worried if it’s been too long since I’ve read a certain book. My favorite books have been read at least three times, if not more, and I always part from them unwillingly, consoling myself with the promise of future meetings. Their crucial value, for me, is not in their plot, though they may have excellent ones that I love and admire, for after the first time through I know what happens well enough. If a book’s chief value was in the information it imparts, I should never reread it unless I had forgotten the information. Nor is their value chiefly in the emotions they make me feel, though emotions enrich the experience, for these are transitory. Rereading a book is not the same thing as reminiscing about a memory. There are superficial similarities, but while memories fade and become distorted over time, a reread book grows stronger and truer in the mind. No, the true value in rereading any good book is something deeper than these. At the moment it is beyond my words to fully explain, but I hope Lewis will succeed in pinpointing it more clearly. But I suspect it has a lot to do with relationships. What is true life but relationships between persons? In literature, I meet not only characters, but also authors, and places, and beautiful words with beautiful meanings, and all of these become friends. Friends different from those I know in person, but no less true in their value. 2) The value given to the act of reading. …the majority, though sometimes frequent readers, do not set much store by reading. They turn to it as a last resource. They abandon it with alacrity as soon as any alternative pastime turns up…But literary people are always looking for leisure and silence in which to read and do so with their whole attention. When they are denied such attentive and undisturbed reading even for a few days they feel impoverished. So true! A persistent sorrow in my life is the lack of a really good reading space. I fall asleep on couches and beds, while the kitchen chairs are a tad too uncomfortable. I’ve tried going to the library to read, but it’s always too loud (Why don’t librarians shush anymore? I thought that was in the job description!). The best place, I think, is the small “library” at my tiny church. I run it, and we’re so small that it’s not much used, so a few times I have gone there on a Saturday or weekday just to read, leaning back in one firmly padded chair while resting my feet on another, and reading by the windowlight. It’s so peaceful that sometimes it does lull me into a pleasant doze, but generally I’m propped upright enough that I can get some very good reading done. 3) The first reading of a book. …the first reading of some literary work is often, to the literary, an experience so momentous that only experiences of love, religion, or bereavement can furnish a standard of comparison. Their whole consciousness is changed. They have become what they were not before. But…among the other sort of readers…when they have finished the story or the novel, nothing much, or nothing at all, seems to have happened to them. To be honest, the intensity of the experience varies based on the quality of the book. My first reading of a Dirk Pitt novel may be exciting because I don’t know the plot, but it hardly evokes strong feelings in me. But after the first chapter of Airman I could already tell that I was in for a truly delightful, rip-roaring adventure told by someone as in love with breathless exploits and good words as I was, and with the talent to pull it off; thus, I was giddy, almost goose-bumpy, as I read it. Again, reading The Lord of the Rings for the first time is a revelation, especially if it is encountered before all the fantasy novels that it inspired. And then, finding The Silmarillion, and Unfinished Tales, and the Books of Lost Tales, and The Children of Hurin, each when you’d thought the previous was the last work of Tolkien that existed, is nothing short of bliss. The mere suggestion that many other people do not have this kind of experience when first reading a book, even an excellent book, makes me very sad. In short, the many tend to forget much of what they read, and seldom care to talk about it. The few, the book lovers, “mouth over their favourite lines and stanzas in solitude,” and seek out other book-lovers with whom to share their reading experiences. This final point reminds me of why I started this blog in the first place. Well, of the better reason, the one that has paid off. The first reason was to keep my analytical mind sharp and my creative mind working with words, to stave off the mental atrophy that I feared after graduating college. But this other reason is to connect with readers with whom I can share my reading experiences that matter most. It is with pleasure, pride, and much gratitude that I look over my blog and the comments it has received and believe my efforts worthwhile. Thank you, all you who comment and read on my site, for being this success. I can do without fame, but would be a fool not to seek out friends and love them when I find them. Especially genuine lovers of reading. Recently I reviewed the novel Myst: The book of Atrus, in which an arrogant man named Gehn eagerly instructs his son, Atrus, in the nearly-lost magical Art of D’ni Writing belonging to their now-ruined civilization. This Art, and much of the novel’s themes, works as a fairly literal metaphor for J.R.R. Tolkien’s idea of sub-creation, which is elaborated in the above quotation. To re-cap from my review of the novel: The Art of D’ni Writing, called “the art of precise description,” is beautifully literal: when a D’ni writer describes a world, that world comes into existence, and is called an Age. A special paper and special ink are required, as is the special D’ni language in which to write, but still, what is written becomes real. If the writer describes well—that is, precisely, accurately, with detailed knowledge of the elements, physics, wind patterns, tectonic movements, etcetera, and with perfect attention to cause and effect—the Age that comes into being will be stable and fertile, filled with a self-sustaining environment and possibly peopled with whole cities and kingdoms that regard him as a god. But if he writes not well, if he makes mistakes, writes contradictions, if his writing does not have internal consistency, then his Age becomes unstable and eventually collapses into nonexistence. If any changes are made to the Book that describes an Age, those changes will become manifest in the Age itself—for better or for worse! Now, when we write fiction, we are inventing new places and new persons, but the question must always be brought up of whether we truly create anything in our thoughts from scratch, or whether the source of all our thoughts is really somewhere else. The Christian, for instance, believes that every thing is from God and in God’s power; thus when a Christian writes a story, he acknowledges that even his ideas are not truly his own, for his brain is not his own, nor his soul—all belongs to God, the All-Powerful (the originator of all power). Tolkien wrote that the highest form of fantasy was sub-creation, the creation of a fictional, secondary world that had enough depth and detail to maintain the “inner consistency of reality.” The idea of suspension of disbelief may be the most basic form of this idea, as it involves avoiding gross contradictions and disregards to logic in order to allow the receiver of the story to believe in it at the level the story requires. In sub-creation, however, the world-building itself is one of the most important of the story’s elements. A new world is created with its own geography, its own stars, its own trees, its own winds, and they all must make sense together. Yet they need not be mere copies of our own world. Rather, we are encouraged to let the laws of nature inspire us to imagine other ways they might be. In making such fantastical alterations to our invented worlds and in trying as we can to make them consistent within that world, we gain greater appreciation for the balance and artistry of God’s creation. We know we cannot surpass Him, and we do not try to. But in emulating Him by creating in the best ways we can, we show our admiration for Him and we learn more about Him. In the novel, the two main characters hold differing views on how their magical Art works. Gehn believes that he is a god and that his Writing literally creates new worlds ex nihilo. In Tolkien’s terms, he believes he is an original Creator, and that his creation is primary (coming into existence solely by his power). This belief fuels his arrogance, blinds his critical faculties, and ultimately brings out his cruelty. His son, Atrus, eventually comes to disagree with him, believing that by Writing they are somehow Linking to pre-existing worlds. He is uncomfortable with being called a god and worshipped; he is too aware that he himself is a created being, not supernatural or omnipotent or eternal. His belief also implies the existence of an original First Creator, which the book mentions as a possibility but does not further discuss. The book generally sides with Atrus, but leaves enough ambiguity about the nature of the Art that you cannot be completely sure how it works. For one thing, Atrus’ theory depends on the idea that there are infinite pre-created worlds; this is the only way to explain how he can Write such a specific description of an Age in a Book—a place he has never known to exist before—and then travel to it. This idea, while plausible in a fantasy setting, is nonetheless unsatisfactory, for it removes any Meaning and Purpose that comes from the uniqueness of a particular world. Further, it is confirmed that if a Writer makes changes to an Age’s Book, those changes will manifest themselves in the Age. This is how Gehn tries to fix all his Ages that are steadily falling apart. The fact that this is possible suggests that the words in the Book do hold the creative power. And yet, one time Gehn’s revisions go too far, in a way that is not completely understood by the characters or the reader. After the latest of a series of Gehn’s revisions to the Book of Age Thirty-Seven, Atrus visits it to discover that it has irrevocably changed. The people on the island of Age Thirty-Seven, who had worshipped Gehn and Atrus and developed relationships with them over a few years, suddenly have no knowledge of them and are hostile. It’s as if Atrus has stepped into a parallel universe. This gives credence to Atrus’ theory that to change the description in a Book does not actually change that Age, but rather Links to a similar Age, one of an infinite pool of worlds. Also challenged, quite interestingly, is Gehn’s assertion that D’ni Writing must be sparse and precise, strictly following the D’ni rules literally and avoiding all contradictions in order to work. To my mind, this is akin to building a fictional world that in all its physical laws is identical to the real world; perhaps the names and geography is different, but there is no magic, no new creatures, no impossible wonders. Gehn believes that this is all that is possible through the Art. We begin to suspect his theory when we learn that, although he follows the Rules to a T, all his Ages are unstable and falling apart. But it is not that the Rules are completely flawed, for Atrus himself follows them carefully—more carefully than his father, in fact—when creating his first Age, which is implied to be perfectly stable and self-sustaining. However, the idea that this is the only way Writing can work is turned on its head by the discovery of the character Katran’s first Age, which seems to break all sorts of scientific laws and yet somehow is stable and incredibly beautiful. Perhaps it is a case where Poetry trumps Logic? Not necessarily—the implication is that even though Katran changed the laws of gravity (among others), she did so with consistency and purpose. This is analogous to the creation of a fantasy world with magic and other impossible features that nonetheless plays true to its own rules. Katran is the character who most purely practices the Art. And, relevant to our discussion, she is the one who perhaps most purely does what Tolkien, MacDonald, and Lewis believe is sub-creation. I do not know if the writers of Myst: The book of Atrus were familiar with the theories of Tolkien, George MacDonald, and C.S. Lewis. Nonetheless, their sub-created world seems the perfect place in which to explore these ideas, and even if the other books in the series fail to deepen the philosophical discussion, I am still grateful for the book even bringing it up. When I write anything at all, it is an act of worship to my God, however poor due to the limitations of my heart. When I write fantasy, when I create new characters and grow them and become attached to them, it helps me get a tiny view of how God sees us. He is the great Author.